2018 will be an inflection point for smart home technology For many years, smart home technology languished at less than 5 percent household penetration, failing to attract consumers beyond early technology adopters. In 2016–17, the market saw the first real signs of growth as telcos, utilities and security companies, as well as heavyweight technology companies including Samsung, Google, Amazon and Apple all ramped up their investments. This year will continue to see rapid growth, and by the end of the year there will be more smart home devices installed than there are tablet PCs. Over the next four years, the market will continue to grow to an installed base of more than 4 billion devices by the end of 2021, representing one of the biggest growth opportunities in the consumer technology industry. Before the industry can truly reach the mass market, several barriers need to be overcome – the biggest of which is the lack of understanding among consumers about the value smart home technology can bring. 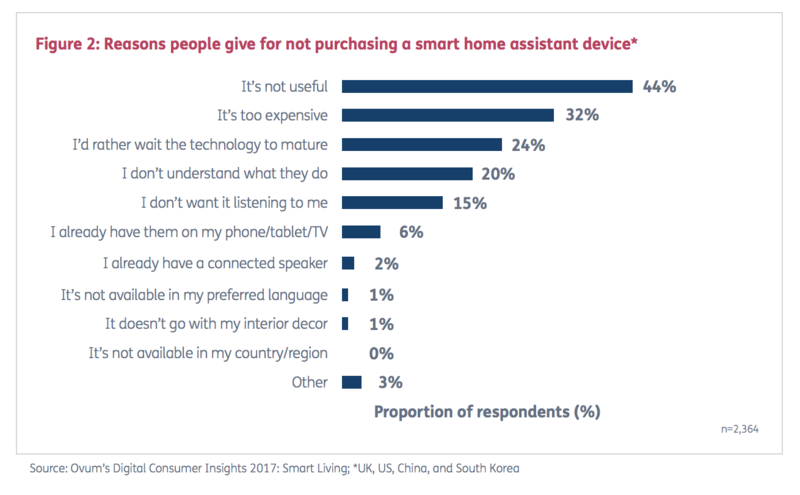 Drawing on Ovum’s Digital Consumer Insights 2017 survey data, Figure 2 shows why consumers may choose not to purchase a smart home assistant device such as the Amazon Echo. By far the most popular answer (given by 44 percent of respondents) was that they believed the device would not be useful, but 20 percent of respondents did not even know what such a device did. A further 32 percent of respondents thought smart home assistant devices were too expensive, which again may have reflected a lack of understanding about the technology’s value. Although Figure 2 shows opinions on home assistant devices, consumers often express similar feelings for other forms of smart home tech, which all tend to come at a premium price over non-smart, unconnected products. A single Philips Hue lightbulb can cost as much as $50. In order to show the value of such products, in 2018 there will be a significant increase in marketing for consumer-facing smart home technology, particularly around introducing different use cases and greater functionality for smart devices in the home. That $50 lightbulb, for example, could be used as part of a burglary deterrent system, which for some customers may actually be a small price to pay for greater peace of mind. Getting these messages across to the right consumer segment is key. To increase the marketing complexity, the potential uses of a single device can be varied, and there is an element of personal taste or circumstances involved – what is considered valuable to one customer could be completely different for another. Therefore, Ovum expects social media to play a big part in capturing, and then promoting, real-life stories of how smart home technology has changed the lives of ordinary people. The inclusion of more smart home technology in retail store demonstration areas (such as those in Ikea, for example) will also help to educate consumers on how new technology can be used in their own homes. Consumers do not just go out and buy a “smart home.” Rather, the home environment will evolve gradually over time as consumers gradually add more and more connected devices to their home. Therefore, the performance of those initial devices is important. A good early experience will encourage consumers to quickly invest further in smart home technology, while a bad experience will deter them. Consumer apathy is dangerous; and as much so for smart home device vendors as for service providers. 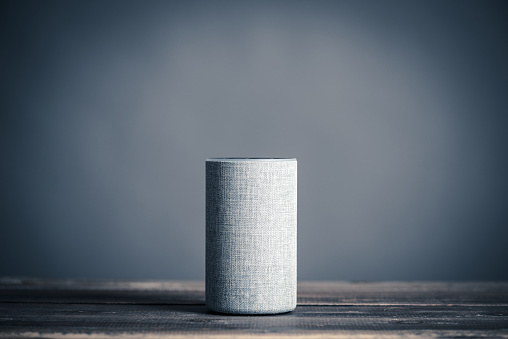 Vendors may rely more heavily on retail sales of their smart home devices to drive revenue, but if consumers do not remain engaged beyond the initial “honeymoon period” after purchasing their first product, vendors will struggle to find further upsell opportunities and will be less likely to benefit from word-of-mouth marketing. The latter is badly needed in the smart home industry, because it enforces the value marketing message with consumers. Therefore, vendors need to continue to innovate and evolve their technology, as well as quickly fixing defects. This will ensure better customer engagement with their products. Service providers may be more experienced with supporting an ongoing relationship with the consumer, but are not necessarily agile enough to continue developing their smart home propositions at the speed that consumers expect; some may find an enabling role a more comfortable fit. 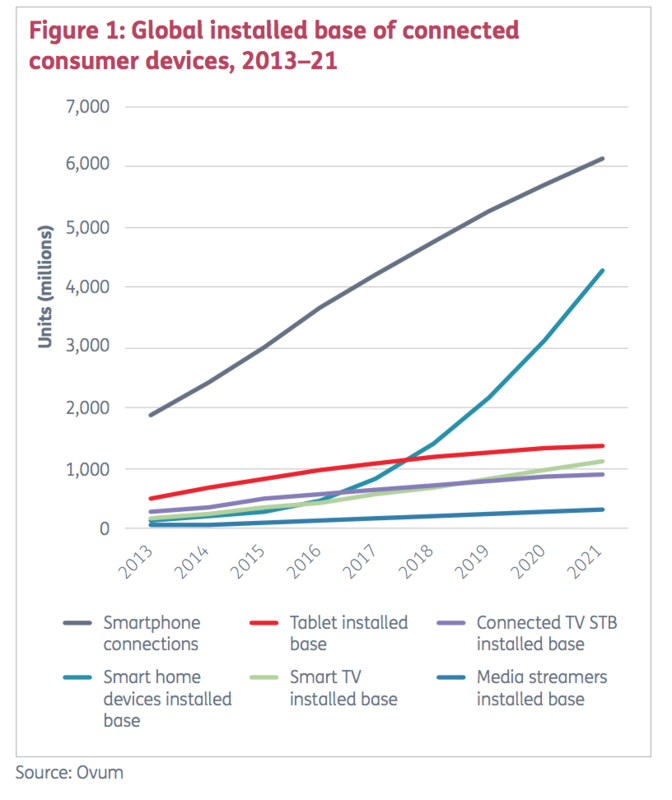 A detailed understanding of the smart home device market is essential. This way players can not only segment the market properly, but also change marketing messages according to segment, to make sure the right values are being highlighted. Many smart home providers have launched products without fully understanding the market. This means they risk wasting investment on product development and integration on top of sales and marketing costs. Different consumer segments have different demands and interests. Understanding such nuances is vital to a successful campaign. Providers must focus on demonstrating the value of smart home technology in real-life situations. Often, it is only when consumers experience smart home technology first-hand that they truly understand its value. The more a supplier can demonstrate smart technology adding value in real-life situations, the easier it will be for consumers to understand the benefits of the smart home (especially if consumers are allowed to experiment themselves). Work closely with key retailers to educate the end user. For equipment vendors (especially those with no direct-sales capabilities), trying to convey the message to consumers about the value of new smart home technology is particularly difficult. Having a good relationship with retailers that can help solve this issue – through in-store showcases, for example – will be a significant advantage. Where possible, partner with retailers or service providers that have a dedicated team of engineers in the field. As discussed in Ovum’s 2017 report, Driving Greater Customer Satisfaction from Smart Home Service Delivery, service providers that use an engineering “field force” to help sell their smart home portfolios have a big advantage. Centrica in the UK and Vivint in North America are good examples of this, and home automation firm Control4 has had much success working with high-end hi-fi retailers to the same effect. Service providers and retailers that employ field engineers will provide a more successful sales channel than the standard high street or online store. Vendors must take measures against customer apathy, frustration and lack of trust. Not only will these things discourage existing customers from purchasing more products, but the lack of positive customer recommendations will also curtail smart home growth. Therefore, vendors must continue to innovate and evolve their products to find more points of engagement with consumers, as well as quickly fix any defects or points of customer frustration. For more information about IoT research and analysis from Ovum, which belongs to the same corporate family as IoTWorldToday.com, send email to marketingdepartment@ovum.com. It’s rare to build a smart city from scratch, but that’s what Vienna is doing on the site of an abandoned airfield in the outskirts of the city. Your products are telling you how consumer IoT can achieve mainstream adoption. Are you listening to them? The company RTI is working on a microgrid solution that is fueled by Industrial Internet technology.